Desborough Town are back on the Buildbase FA Vase trail this weekend. 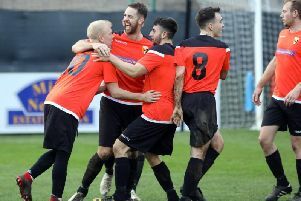 Ar Tarn, who reached the last 32 of the competition last season, head to Midland League Division One outfit Cadbury Athletic for their third-round tie tomorrow (Saturday). Desborough produced one of the best results in the club’s recent history in the last stage as they claimed a 2-0 victory at Worcester City. And while they were the underdogs for that clash, joint-manager Lee Duffy has admitted that is not the case this time. “They (Cadbury) are in the same league as Worcester but in the division below,” Duffy said. “I think we went to Worcester very much as the underdogs and when that is the case, it gives you a bit of a different attitude. “When the draw for this round was made, we probably felt like we got as good as we could have got and there is a danger that comes with that as well. 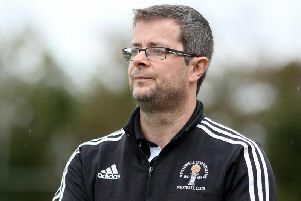 “But the fact is that any team that reaches the last 64 of a national competition is obviously doing something right so we will have to go and perform well. “While we were so happy to get through the last round, we would be disappointed if we went out this weekend. Desborough go into the Vase tie on the back of a 2-2 draw at Future Lions United Counties League Premier Division leaders Daventry Town last weekend. Ar Tarn led 2-1 until late on but had to settle for a seventh draw of the season. And it’s that statistic that Duffy knows is stopping his team from being in the upper reaches instead of where they currently sit in mid-table. He added: “We got the draw at Daventry last weekend and that sums up our season to be honest. “We have drawn against a lot of the top sides and it has actually cost us. “I think our league position is a bit false but it looks that way because we have drawn twice as many games as anyone else. “Individually, those draws look good but collectively they have held us back a little bit. Wellingborough Town's UCL Knockout Cup hopes were ended after they were edged out 2-1 in their quarter-final at Holbeach United on Wednesday night. Carlos Lewis brought the Doughboys back level after they had fallen behind to a Billy Smith goal but the same player grabbed the second-half winner for the hosts. Rothwell Corinthians will have to wait for the chance to earn a place in the last four after their clash with Deeping Rangers on Tuesday night was postponed due to a waterlogged pitch at Sergeants Lawn.